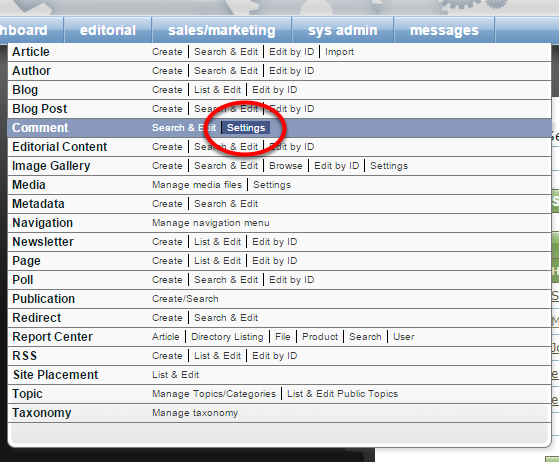 ePublishing Knowledge BaseePublishing Knowledge BaseePublishing Knowledge Base EditorialHow do I control my comments? Can I moderate them? You may use the Comment Manager to control comments on the website and easily review user-submitted comments on your articles, blog posts, directory listings and products. For ePublishing websites that are using third-party commenting solutions such as Disqus and other 3rd party commenting providers, refer to documentation provided by those solutions. limiting the spam in comments: How do I limit spam in comments? managing comments: How do I manage comments? 1. To enable comment moderation, click Settings next to Comment in the navigation. 2. Enable moderation and notification within the Comment Manager Settings. Zoom: Enable moderation and notification within the Comment Manager Settings. To enable moderation, which requires approval of comments before they post, click the box next to Enable moderation? Click the box next to Enable spam filtering? to minimize spam on your comment feed. Set a notification email if you'd like to receive emails every time a comment is posted. If you've made changes, Save. Prev: How do I apply a special style class to content on the site? Next: How do I lock an article to requiring a reader login, register, or have a current subscription?